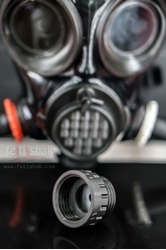 Fitting for close ends junction of gas masks and accesories with NATO40 threads. Select desirable thread and colour. F plug can be completely closed (permanently sealed) or have an aperture where the rubber gasket with 7mm hole can be inserted or full blinding rubber gasket respectively.